I’ve spent the last two weeks holed up in my room, studying for the very last of my exams. It was an oral and written exam on the Sacrament of Reconciliation, and you have to pass it to hear confessions once you’re ordained a priest. They asked me every question in the book, but thankfully the study paid off, and now I am exam-free. Hallelujah! 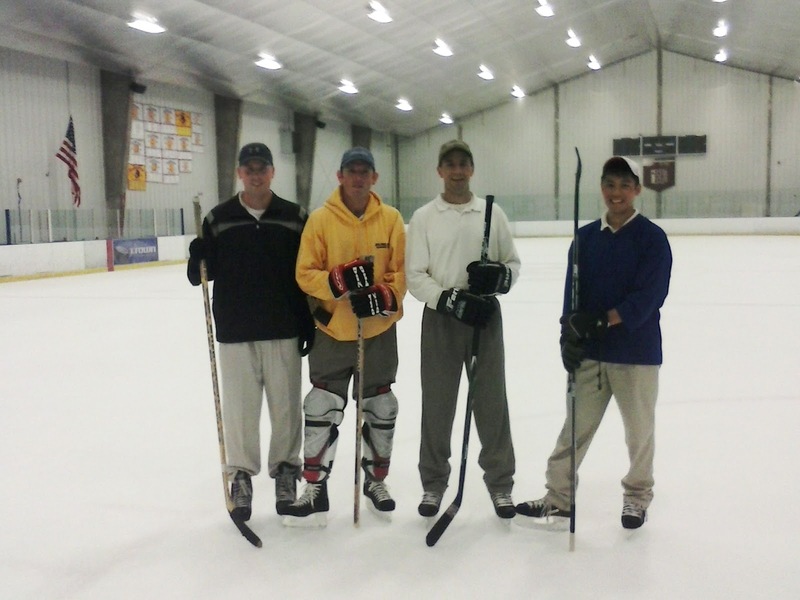 I felt like running off into the sunset afterwards, but instead went to play ice hockey with some old friends. In the photo you see, from right to left, Brother David Barton, who I met on the soccer field in 1995 when he gave me a firm kick to the shin, thus igniting a long friendship. (I still have the bump on my shin!) Then there’s yours truly in gold, followed by Father Daren Weisbrod, who used to be the brother who watched over us back in High School Seminary. He still wields a pretty mean hockey stick, and has lost none of his humor and good cheer. On the far right is Father Jason Huynh. Father Jason and I joined the seminary together in 1994, so needless to say, we’ve been through a lot together. Let me just warn you, in a snowball fight, you don’t want to be against Father Jason! I’ve been spending most of my time in Cincinnati, Ohio, where I’ve been assigned for my first three years as a deacon and priest. I’ll be helping out with youth work in the area and at a Catholic school here, Royalmont Academy. I remember back in 2004 when I first came here as a brother and walked into Royalmont, just being overwhelmed by the special something that you breathed there. The students and teachers and parents radiated a joy and peace that made me want to keep coming back. So I’m happy to return, and help in any way I can, first as a deacon, and later as a priest. Back in 2004-2007 I also helped direct weekend retreats for boys at Camp River Ridge near Cincinnati. Each retreat was a combination of sports, crazy competitions, prayer, great food, and fellowship, all of which I thoroughly enjoyed. Being in Rome was awesome, but many times when I was poring over those theology books, I’d get a hankering for a good old game of capture the flag or some of Mrs. Weisbrod’s (She and her husband, Tom, graciously host the retreats) biscuits and gravy. So I’m sure you get the picture: it’s great to be back!!!! I had thought this was the only place they wouldn’t send me, since I had been here before, and so it was a total surprise when I received the assignment. Surprised and overjoyed, those are the two words that describe it best. And grateful to God for bringing me back. This afternoon I head over to Saint Louis, Missouri to visit my folks and assist as deacon for the first time at my home parish, Saint Mary Magdalen in Brentwood. Over the years I received all of the greatest gifts of my life there, starting with baptism, then my first holy communion, and my call to be a priest. (not to mention the time I won the cake walk and got to eat a whole cake!) My heart is full of gratitude to God for his guiding hand and protection on this journey, and I pray that he’ll guide me safe and sound to ordination as a priest in December, so I can come back home and celebrate mass in the place where it all started. Please say a prayer I have a safe drive over, and know that you are in my prayers these days. When I pray the Liturgy of the Hours, there’s a moment for intercessions, and I always toss in a “For everybody who reads those cobblestones message too!”. I was thinking about whether I should change the name “cobblestones” since I’m not in Rome any more, but a friend told me that downtown Cincinnati has some cobblestone streets too, so it will do for the mean time.